During World War Two, conscientious objectors in the US and the UK were asked to volunteer for medical research. In one project in the US, young men were starved for six months to help experts decide how to treat victims of mass starvation in Europe. In 1944, 26-year-old Marshall Sutton was a young idealist who wanted to change the world for the better. As a conscientious objector and Quaker, he refused to fight in the war but he still craved the chance to help his country. "I wanted to identify with the suffering in the world at that time," he says. "I wanted to do something for society. I wanted to put myself in a little danger." That danger came, unexpectedly, in the shape of a small brochure with a picture of children on the front. "Will you starve that they be better fed?" it asked. It was a call for volunteers to act as human guinea pigs in a medical experiment at the University of Minnesota. All over Europe people were starving - in the Netherlands, in Greece, in eastern Europe and the Soviet Union - and the US military wanted to learn how best to re-feed them. But first they had to find healthy people willing to be starved. Perhaps surprisingly, hundreds of conscientious objectors - or COs - applied, all eager to help. Sutton was grateful to be one of 36 young men chosen. "I felt very useful, fulfilled," he says. "There were hundreds of people like me who didn't have that type of opportunity, and I felt very fortunate that I could be there." The experiment started in November 1944 and for the first three months they were fed to their optimum weight and monitored. Then their rations were cut dramatically. Food quickly became an obsession. "I ate what I had in about three minutes and got out of there - I didn't want to stay," says Sutton, remembering mealtimes in the canteen. "There were some in the experiment who lingered over that food for 20 minutes. I couldn't take that. Some fellows were reading cook books all the time." The men ate meals twice a day. One might be cabbage, turnips and half a glass of milk. On another day, it might be rye bread and some beans. Like many hungry people in Europe, the men never had meat, and calories were set at 1,800 or less. But Sutton remembers one occasion when, carrying his meagre rations in a paper bag, he took his girlfriend out to dinner at the most expensive restaurant in Minneapolis. "I wanted to take her to a restaurant just to enjoy seeing her eat... but when the waiter came up with the food she just couldn't do it. I was a bit disturbed by it, I'd spent all that money on a big meal and she just couldn't eat it." The regime was tough - during the six months they were being starved, the men were expected to walk or run 22 miles (36 kilometres) every week, expending over 1,000 calories more than they consumed each day. Their walks took them past bakeries and other temptations - and it was all too much for some participants. Three pulled out of the experiment. Those that remained lost about 25% of their weight and many experienced anaemia and swollen ankles, as well as apathy and exhaustion. Their ribs stuck out through their skin - their legs were as thin as their arms used to be. And there were psychological effects as well. "After you've not had food for a while your state of being is just numb," says Sutton. "I didn't have any pain. I was just very weak. One's sexual desires disappeared." The men grew anxious and depressed. "When something good happened, we would explode with joy and when we were pessimistic we were very depressed," Sutton recalls. "I had a very close friend there and often I'd speak sharply to him and I'd find myself going to him almost every night and apologising." The men coped in different ways. One man managed to study for a law degree. Sutton read philosophy and theology, and drew comfort from Quaker friends and the church. Others struggled, occasionally eating illicit food before becoming despondent with guilt. One man even cut off a finger while chopping wood and couldn't explain how or why. The experiment is still cited as a source of reference by academics studying nutrition and eating disorders, and it raised many questions about how far psychological problems can be treated if the subject is still starving. But in some ways the project came too late. Even as the experiment continued, one Nazi concentration camp was liberated, then another - and the full horror of starvation became apparent. BBC correspondent Edward Ward entered the Buchenwald concentration camp in April 1945, seven days after it was liberated. "A hollow-eyed emaciated German Jew hobbled across to me," he reported. The man opened the door of a large cupboard. Inside there were about 20 corpses piled high. "'Last night's crop,' said the man, almost casually. 'It'll be the same tomorrow, and the next day, and the next day.' 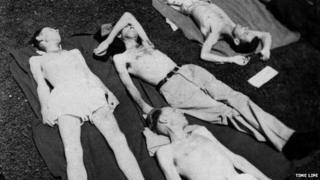 The wretched inmates have been freed from their Nazi tormenters, but they've not yet been freed from slow starvation." But while the results may have come too late for many of World War Two's victims, they still could help others. In 1946, the researchers released a guide book for aid workers - Men and Hunger. In the last months, the Minnesota men were fed back to health. Different groups got different foods and calorie allowances. But it was months, even years - long after the men had returned home - before they had all fully recovered. On the day Marshall Sutton left Minnesota, he took a bus to Chicago. "Every time the bus stopped I had a couple of [milk-]shakes and the world was a wonderful place," he says. "I had a wonderful sense of having all the food I wanted, but I didn't have the strength - I was so happy and I was eating, but I wasn't normal." Sutton, like most of the volunteers, went on to lead a healthy and successful life. He worked in Gaza with starving refugees in 1949 then took part in Quaker projects in the US. Now 95, he lives in a Quaker Community in Baltimore. Seventy years on, he is still glad he took part in the experiment. His friends were risking their lives in the South Pacific, he says, and it was an honour to make a sacrifice himself. Janet Ball's Witness is broadcast on the BBC World Service on January 20 from 08:50 GMT. Listen via BBC iPlayer Radio or browse the Witness podcast archive.